Born and raised in Minnesota, Michael settled in the Green Mountains of Vermont where he began his full time career as an artist and oil painter in 1977. Over the next 25 years, he developed a highly successful career and national reputation in the field of illustration. His paintings and drawings became highly sought after by publishers, clients and corporations, and he became a featured guest lecturer and instructor at a large number of art schools, institutions and museums. He and his work have been featured in numerous publications including Art of the West, Southwest Art, Western Art Collector, American Artist, The Artists Magazine and Step By Step Graphics. His work is currently sold through several prestigious western galleries, as well as the Prix De West Show (The National Cowboy and Western Heritage Museum, Oklahoma, OK), Quest For The West Art Show (The Eiteljorg Museum, Indianapolis, IN) and the Sale To Benefit The C. M. Russell Museum (Great Falls, MT). His recent awards include the following: 2015 “Best Oil/Acrylic Painting of Show”at The Traveling West Art Show, Southwest Galleries in Dallas TX, 2015; “Patron’s Choice Award”,“Artist’s Choice Award” in 2014, 2015 and 2016 at Quest For The West. Hundreds of collectors and corporations have his paintings in their permanent collections, as well as The Booth Museum of Western Art and the Pearce Western Art Museum. He is a member of the “Russell Skull Society of Artists”, and was invited to a member of the prestigious Cowboy Artists of America in 2016. His ever growing number of corporate and individual collectors appreciate the draftsmanship, use of light and colorful atmosphere that Michael is able to bring to his work. In 2012 he published a new book, a limited first edition of 300, “C. 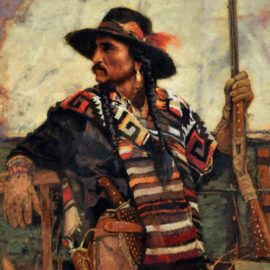 Michael Dudash – Western Collection”, showcasing 87 paintings.